Very recently, QUALCOMM India, a leading developer and innovator of advanced wireless technologies and mobile data solutions, hosted the second annual BREW Developers Conference in Mumbai. In this episode, I speak with Vishal Gupta, senior director of Qualcomm India about Brew and what it means to the mobile development community. The theme for this year’s conference, “BREW Your Way,” is about discovering the limitless possibilities of the BREW solution. Targeted at the wireless community in India, BREW 2006 – India focused on bringing together distinguished members of the industry, both from within the country and around the world. The conference was a platform for the launch of innovative technologies and services and will feature exciting keynotes and technical sessions. Dushyant Mehta and his company, IndiaPicture, has been in the news recently for signing up a deal with Corbis to be their exclusive distributor in India. Corbis is a company owned by Bill Gates and it is the world’s second largest stock photo website. Dushyant’s passion for rich media and content management started in the early days of his career, when he was executive producer for U.R. Productions, a production house specializing in TV shows. After U.R., he was a freelance consultant, advising media companies on digital video technologies. Dushyant co-founded his own online media company, IndiaPicture.com, now the largest online repository of images in South East Asia. Will an Indian clone of an international hit take off in India? That’s what we ask MeraVideo.com’s founder, Kanwaldeep Kalsi whose site is a direct clone of YouTube.com. MeraVideo was recently in the news for being close to signing up venture funding of $1.5 million. We ask Kanwaldeep about his company’s revenue model and its chances of success. Kalsi is an IIT Delhi graduate and has eight years of experience in managing projects of approximately $30M in the United States and India, in a broad range industries including entrepreneurial capacity. Kanwaldeep has sufficient experience in the IT sector and has been involved with a lot of projects on web-site development and hosting. 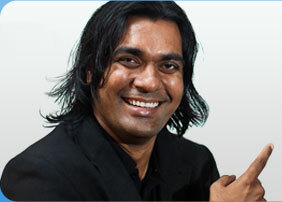 Kanwaldeep successfully founded a television production company and has already produced two shows on STAR TV and SONY. Kanwaldeep’s principal role is to provide overall supervision and strategic direction to the group. In an unprecedented move, RajShri Media, one of India’s biggest movie houses, premiered its latest movie on the Internet, on the very same day of its worldwide theatrical release. Rajshri Media has already aggregated more than 3,000 hours of premium Indian video content across multiple genres. Consumers can stream and download hundreds of full-length feature films, including blockbusters like Phir Hera Pheri, Hera Pheri, Amar Akbar Anthony, Ek Duje Ke Liye, Love In Tokyo, and Hum Aapke Hain Koun..!, among others. Consumers are offered options to stream the movie on their PCs or download the movie with a limited 72-hour license. Consumers can further choose to stream either high or low bandwidth versions of the movie, depending on the speed of their broadband connectivity. Will an Indian social networking site succeed against Orkut? At a time when the social networking space is getting increasingly crowded, we ask her why she decided to jump in now, and how she intends to go up against Orkut. Prerna Gupta graduated from Stanford University and worked in a venture capital firm in Silicon Valley prior to founding Yaari.com. Prerna is of Indian origin but has lived all her life in the US. We ask her if that’s an impediment for her venture. Listen up.